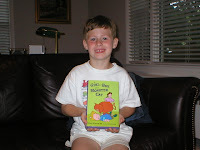 After taking part in MR's 48-Hour Reading Challenge last year, I had the good luck to win a signed copy of Gail Gauthier's book A Girl, A Boy and a Monster Cat. The happy kid holding that book spent nearly a year doggedly asking when the next book was coming out. It was hard to explain, and even harder for a seven-year old to understand that writing and publishing a book takes a L-O-N-G time. When the ARC for A Girl, A Boy, and Three Robbers arrived, he was elated. And yes, I'll admit to doing a happy dance right along with him. The book did not disappoint. We loved Hannah and Brandon and the imaginative games they played. In fact, this sequel was so well loved that it was smuggled into a certain first grade on a daily basis where it was read aloud to a select few friends. While I can't answer William's questions regarding when the next Hannah and Brandon story will be out, I was able to share the thoughts of the author on a variety of questions. Here's what Gail Gauthier had to say on writing, teaching and a bit of character inspiration. Thanks to Gail for sharing her thoughts. Tricia: How has writing these stories about Hannah and Brandon been different from writing books like Happy Kid! and The Hero of Ticonderoga? Gail: With Happy Kid! and The Hero of Ticonderoga I was working with novels. With the novels, I needed a personal story for my main characters that would extend over many chapters, and every single thing I did with those books had to support that story line. My first draft of a chapter book did involve one story extending over chapters--a chapter novel! But it just did not work. Once I came up with the idea of using Hannah's reading as a jumping off place for adventures, I began to work with a story collection format, similar to the one I used in my first book, My Life Among the Aliens. Aliens was a very good experience for me. I liked the idea of trying to do something like it. I can't say I ever sit down before writing a book and say to myself, Okay, what theme will you work with on this one. But theme is important to me. Looking back, almost all my books have dealt with child outsiders struggling with the issue of how much they are going to conform--Butch and Spike, Hero of Ticonderoga, Saving the Planet, and Happy Kid!. You can definitely see it in The Hannah and Brandon Stories, too. The neighbors do not get Hannah and her game playing. She holds out. The individual wins against the society of the neighborhood. You see it again with Brandon. He is constantly struggling to maintain his individuality and not allow himself to be overwhelmed by Hannah, who is in charge of the society in her home and yard. Tricia: The Hannah and Brandon books are beyond beginning readers, so the need for controlled vocabulary isn’t as great, but I am interested in knowing if you had to think about language (word choice) in a different way? Gail: I am very careful about language and word choice, anyway. The sound of sentences and, especially, dialogue is very important. Because I write a lot of humor, I may obsess about word choice more than some writers do. One word can determine whether or not a line is funny. With Monster Cat, in particular, I was very conscious of the fact that I was writing for less experienced readers who might not have a large vocabulary or, at least, a large reading vocabulary. For instance, in the dinosaur story I referred to "meat-eating dinosaurs" and "plant-eating dinosaurs" instead of naming specific kinds of dinosaurs, which would have required long, difficult words that first and second graders might not be familiar with. Overall, though, it wasn't a huge problem, perhaps because I restricted the setting to Hannah's home and yard. Our home vocabulary tends to be simpler than the vocabulary we use at work or school. Tricia: Was the work with your editor any different for these books than for your middle grades books? Gail: Funny story. I worked with the same editor on my first six books. I'm told that's rather unusual. Kathy had a huge influence on me as a children's writer. She really shaped my attitudes about what a children's book should be. Well, I submitted a picture book and then a chapter book to her, but before the project got any further than that, she left Putnam for another publishing house. I think most authors will tell you that it's somewhat traumatizing to lose their editors. I didn't sleep for a couple of nights after she called and told me she was going. We were still finishing Happy Kid! and Putnam assigned me a new editor, Susan, who worked with me on that. Susan accepted the first Hannah and Brandon book. (Because she is wonderful, too.) So, not only was I working on a different type of book with Hannah and Brandon, it was my first entire project with a new editor. Given all that upheaval, I'd say that working with an editor on these books wasn't dramatically different. Tricia: What do you think illustrations add to the experience of reading these books, and other chapter books in general? Gail: Well, I have a bit of a business writing background, and it was with business writing that I first became concerned with the significance of paragraphs, the use of white space, etc. So I'd say that I think the big thing illustrations do for kid readers is break up the text so that it doesn't seem as imposing for them, just as subtitles and paragraphs break up text for adult readers of reports. Additionally, illustrations help readers translate written description into visual images. I don't know if that's something younger children have a problem with or not. Tricia: What kind of response have you gotten from kids regarding Hannah and Brandon? Gail: I've done one school visit around Monster Cat, and if I recall correctly, the kids were primarily interested in Buttercup, the cat. I recall talking quite a bit about my niece and her cats because they were the original inspiration for the book. I have to say that as a general rule when I'm in schools kids want to talk less about my specific books and more about me in general. They ask questions about Gail the writer. Where do I get my ideas? Which is my favorite of the books I've written? How many books do I think I'll write? They also like to talk about their own writing and tell me that they're writing books. I hear that a great deal. It always interests me because I wanted to be a writer from an early age, but it never, ever entered my mind to write a book then, as a child. Last spring I had a fourth or fifth grader asking me very detailed questions about publishing. Among the things she wanted to know was if publishers like first-person narrators. It was the kind of question I'd expect to hear at a writers' conference. Tricia: Can you talk a bit about any memorable school visits you’ve had talking about these books? Gail: I was invited to go into a fourth grade classroom in a neighboring town to read for this spring's Connecticut Loves to Read Day--adults go into schools to read, the idea being to model reading. Fourth grade was a little old for The Hannah and Brandon Stories, but I find it difficult to find isolated readable bits in my novels. So I read these kids the Pinocchio chapters from Three Robbers. The story went over very well, and when I told them about the book I had been working on last year, they loved the premise. So wasn't my self-esteem all pumped up. Then we started talking about what they'd been reading. These kids clearly were readers. They talked and talked. The teacher had to break us up. At my last school visit this past spring, I was talking with kids in grades 1 through 4. The Monster Cat presentation was new and I'd been nervous about it, but everything went well. And the kids were so full of things to ask or share afterwards, that after one presentation I had to walk out into the hallway with a little group so that we could keep talking as long as possible as they headed back to their classroom. I love that kind of thing. Gail: My kids have definitely seen things that have happened to them show up in my books. We're all in my books and yet...we're not. It's a very strange process the way reality becomes something else when I'm writing. Saving the Planet relates very much to one of my sons, yet absolutely nothing in it ever happened to him. He gets it. He understands what I mean when I say that it's his book, but his father doesn't see it. Another book belongs totally to my other boy. He gets it, too, and made a joke about me stealing his life. (I also stole from the neighbor boy for that one.) The brothers in the Aliens books are named for my sons, and though I'm sure most readers focus on the funny situations with the guys from outer space, those books are a record of my family's life--the games the kids played, the birthday party, the tree houses, the camp outs with Dad, the school fund raisers, the hamster. When I say my life is an open book, I mean my life is an open book. You just have to know how to decode it. There are aspects of me in most of the mothers, but I also identify with Nora, the aging environmentalist in Saving the Planet , because when I was young, she was who I hoped to be when I was older. The setting for Hero comes directly from my life from the time I was around three until the end of second grade. Yet, I was never as strong and tough as Therese LeClerc, the main character in that book, and nothing that happens to her ever happened to me. Well, except for not liking the food in the school cafeteria. And the Polish polka business happened to my sister. And I did ride to Catechism class with my father in his truck. But, still, I am not Tess. Tricia: I want to go back to word choice for a minute. Do you ever use your kids as a “sounding board” for things like language? Do you ask them what kids might say or do in a situation, or do they offer advice (even when you might not want it)? Gail: I definitely used my kids as a sounding board when they were younger, and specifically for language. I used to pay them, and sometimes their friends, to read first drafts for me and critique them. The boy next door used to eat at our house on Sunday nights, and we would go over things at dinner. One of the best bits of info I ever got from a kid came from his sister. I was looking for detail for Happy Kid!, and I asked her to describe the popular kids at school. She said, "The popular kids at school are kids nobody really likes." I thought that was brilliant. It was incredibly helpful. Gail: My degree is in secondary education with a major in English and a minor in history. But the education classes I took in college were nothing like I read about now or hear about from family members in education programs. I don't recall getting much educational instruction. I was very unprepared for student teaching, and it was a disaster. So much so that I didn't even pursue teaching after college but instead took an office job in a continuing education department at a state university. But the teaching thing keeps coming back to me like some kind of boomerang. Many years ago I taught a few business writing workshops to adults through non-credit college programs. I taught Sunday school for eleven years. I was a volunteer computer skills tutor in my sons' kindergarten programs for two years. I volunteered in their classrooms for three years working with the writing program. Our school had an art appreciation program taught by volunteers, so I did that for two years. I taught six-week , weekly writing classes as part of an enrichment cluster program at an elementary school three times. I've taught writing workshops to mixed groups of adults and students. Yes, I was an assistant taekwondo instructor for two years. And then I've been doing school and conference presentations for the last ten to twelve years. So while I've never taught professionally, I have a bizarre, checkered history of doing teacher-like things. And yet I'm not at all interested in using my fiction to instruct the young. I think instruction in literature always calls attention to itself, and readers shouldn't be aware of anything but that they are in the world of a story. I do have a number of books with school settings, though, and I'm sure that's because of all the time I've spent in classrooms of one kind or another. Those are some mighty fine responses. Thanks again to Gail for spending some time here. In celebration of the release of her new book, Putnam and Gail Gauthier are running A Girl, a Boy, and Three Robbers contest. The first person to e-mail Gail Gauthier with their mailing address, saying that they saw this message on The Miss Rumphius Effect, will receive a free, autographed copy of A Girl, A Boy, and Three Robbers! This tour has been quite a lot of fun, so if you haven't been along for the ride, be sure to check in on the other great stops. Great interview, Tricia. I'm glad you asked her about vocabulary. I wonder about that when I read chapter books, but I didn't think to ask her.